The hours of darkness have become Laura Muir’s norm of late, night shifts tending to stricken stallions and forlorn foals at Glasgow’s equine hospital turning the double European indoor champion’s schedule upside-down. Emerging into the daylight yesterday, the 24-year-old instantly re-awakened her competitive fires after a three-month hiatus from the fray in which her veterinary studies have been the top priority. For the fourth time in five winters, and the third time in a row, Muir took the Scottish short-course cross-country title, sweeping away any cobwebs in style in Kirkcaldy with a victory that appeared pre-destined from the moment she bolted to the front and relentlessly gambolled away. It was almost as impressive as the manner in which she has pursued a demanding degree with as much vigour as her athletic self-improvement. 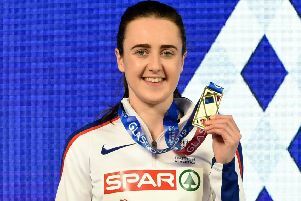 Cardiology this week will be the next block to challenge her brain, but at least there is the promise of a first day off in an age, granted to attend the British Athlete of the Year awards in which she will be assuredly a contender. Small breaks in an otherwise hard spell, she revealed. “I came off night shift yesterday which was quite rough. But it was fine. I managed to complete the whole rotation without getting kicked by a horse. I reckon it’s probably been 70 hours a week there. That is not to say that the drive for success has been depleted. Here she bolted around the 4km course before finishing in 12 minutes and 53 seconds, well ahead of Steph Pennycook with Morag MacLarty pipping the promising junior Anna MacFadyen for third. After graciously posing for innumerable selfies, it was off for another hour of training on site. Every available opportunity taken.